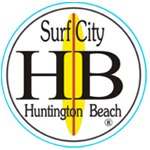 JUST SMOGS® is proud to be operating in Huntington Beach since 2000. We appreciate all the local support and loyal customers over the years. Why Choose Us? : We’re Committed to 5 Star Service! – Air Conditioned Waiting Room with FREE WiFi ! Please review the JUST SMOGS® site to learn more about the California smog check program. If you have any questions regarding the California DMV emission inspection program please call us at (714) 596-1019. 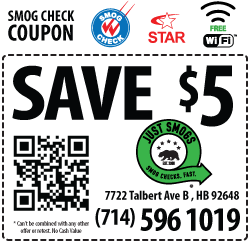 Take advantage of our smog check coupon. When you are ready to make an appointment (optional) for a smog check, please call us or schedule online. JUST SMOGS® is STAR certified. Thank you for allowing us to take care of all your smog check needs.